First responders have always been Nathan's Super Heroes. One night around Christmas when Nathan was 3 1/2 years old, he asked "What would happen if Santa got stuck in a chimney?" He started making up different scenarios about what could happen. 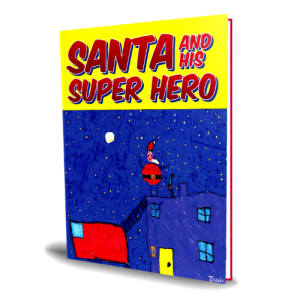 Before we knew it, we came up with the story of Santa and His Super Hero. When he was 8 years old, he asked if we could turn our story into a book. After a long search for an illustrator, his grade 4 teacher, Mrs Shinkewski, asked if her class could illustrate our book for us. Little did we know that she had a surprise for us. As the kids illustrated the book for us, she had them write their own Christmas stories. This is when Nathan wrote the story of Zippy and His Super Hero. As we develop and write more Super Heroes books, we look forward to Mrs Shinkewski's class' illustrations. When we first started the publishing process, Nathan asked if we could use some of the money that we make on the book to help others. The net proceeds of the sale of our books will be donated to different charities. Since Santa and His Super Hero features a firefighter, we are donating the net proceeds of Santa and His Super Hero to the BC Professional Fire Fighters' Association Burn Fund. 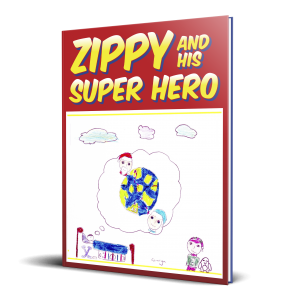 Zippy and His Super Hero doesn't actually feature a first responder so we will be donating the proceeds from that book to the Canucks for Kids Fund. As we develop more books, we will be donating the net proceeds to a charity that is associated with the first responder featured in the book.